The Men’s Army Black Knights Pitch V Neck Pullover Jacket by Colosseum comes with a loose-fit body made from 100% 3.2 oz. polyester that with layering helps keep you warm no matter what your activity is this winter. 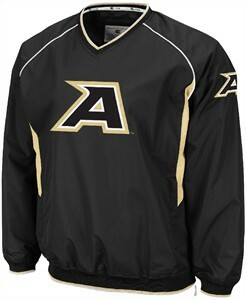 To show you’re a fan of the Black Knights this Black pullover jacket comes with front chest and left sleeve embroidered team logos to show off your team pride and also features side pockets, an inner mesh liner, color contrasting ribbing on the hem, neck, and sleeves, and color contrasting side panels.